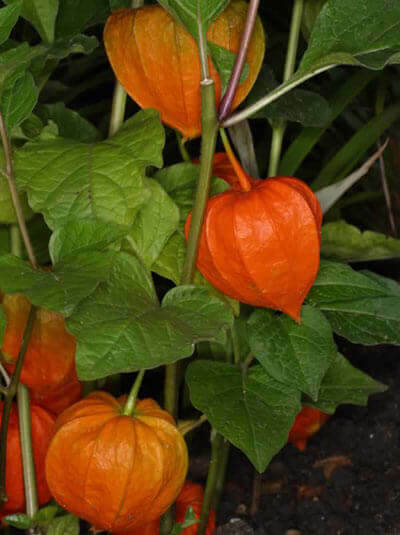 Also know as Bladder cherry, Chinese lantern, Japanese lantern, or Winter cherry, Jessie's Baubles; is a relative of the Cape Gooseberry, easily identifiable by the larger, bright orange to red papery covering over its fruit, which resemble Chinese lanterns. It is native from southern Europe east across southern Asia to Japan. It is an herbaceous perennial plant growing to 40-60 cm tall, with spirally arranged leaves 6-12 cm long and 4-9 cm broad. The flowers are white, with a five-lobed corolla 10-15 mm across, with an inflated basal calyx which matures into the papery orange fruit covering, 4-5 cm long and broad. It can have medicinal purposes.